Food is an essential part of life, but we often only hear or read about what we should or shouldn't eat. Too infrequently do we really think about how we eat. How we eat doesn't just refer to whether we use our hands, forks or chopsticks — it's about the social engagement of eating and how it shapes cultures and family traditions. And, as we age, the way we eat while engaging with others also has the ability to help us live longer, healthier lives. It may even prevent chronic diseases, depression and other mental or physical conditions, according to research. Amber Spivey, Registered Dietitian at Casey's Pond, knows that food is the path to many positive health benefits for seniors. She spends her days developing ideas that make food one of the most exciting aspects of life at Casey's Pond. The dining room at Casey's Pond can be a vibrant and inspiring place during mealtimes — a place where residents come together to build relationships, laugh, reminisce and stimulate their minds. "We are enhancing lives and building relationships through food — it's something I'm really passionate about," she said. Research shows that eating alone can lead to negative consequences for seniors, including malnutrition, loneliness, depression and chronic disease. Malnutrition alone can lead to a weak immune system (which increases the risk of infections), poor wound healing, muscle weakness and decreased bone mass (which can lead to falls and fractures), according to the Mayo Clinic. Longevity research also shows that enjoying healthy meals with others can actually help us live longer. "Research shows that people think food tastes better when they're with others," she said. "It has a positive effect on our mood and the quality of our social relationships." Plus, eating together is just more fun. Spivey sees residents build friendships as they talk about their food, memories or the events of the day in the dining room at Casey's Pond. "You might see four people sitting together at a table who were strangers before they sat down," Spivey said. "They came together because of food, and now they're enjoying each other, building relationships and positively influencing each other's dietary habits." Spivey helps make food an interactive and engaging part of life for these residents. They'll get together to prepare meals — such as a Mediterranean salad or fresh tomato-herb watermelon salad — which helps them learn about and enjoy nutrient-rich foods. "With these programs, the goal is to create a home-like environment where we can engage residents so they can not only have a say in the process but are actively involved," Spivey said. Food forums where residents come together and talk about the dishes they'd like to see on the menu are held monthly. Chef Patrick Keogh is usually there to get inspiration for dishes that pull from residents' memories but are also prepared more nutritiously than in their past. "We pull from their own memories by finding out which foods or recipes evoke positive memories," she said. "We take those ideas and try to make them a little healthier." Spivey is working on a new program called Nourish in which Casey's Pond will feature one resident's recipe each month, presented to the entire community as a special dinner. "Whether it's a family recipe or something they made every Sunday, they have stories to share about this food," Spivey said. "One of our residents has a lamb stew recipe that's near and dear to her heart." Sales and Marketing Director Melissa Lahay said these types of programs are exactly what Casey's Pond is all about — helping residents thrive. This core value at the community is why meal plans are included across all tiers of living services. Lahay said people are often surprised to learn that meals plans are even included in the monthly cost for independent living residents. 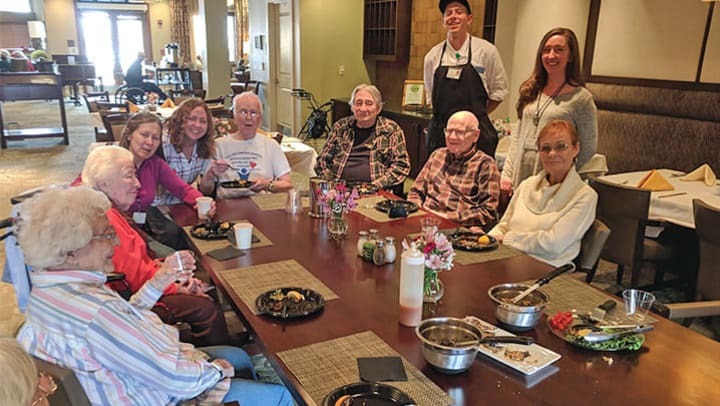 "It goes along with our community principals of taking the institutional model of senior living away and creating a community where residents have choice and input into their lives and experiences," Lahay said. This article first appeared in Steamboat Pilot & Today and is used by permission.